When I first met my fiance, I was still in college. He was so attentive, a trait he portrayed mainly by bringing me food every weekend. We joke that in the beginning he cooked for me regularly, he's actually quite a creative cook. (I should post one of his recipes here one day) Now, I cannot even recall the last time he turned on the stove. In his defense, he has offered a great compromise: his new way of cooking is taking me out to dinner every night during the weeks that he doesn't work, which is quite often and which I gladly accepted. What kinds of food did he bring me during those first months of our relationship? Grilled salmon, stuffed portobellas, to name a few but the one that stands out the most was miso soup. At that time, he didn't know that I was not particularly fond of miso, and not wanting to seem ungrateful, I graciously accepted and it eventually it grew on me. Surprise, surprise. It pays to be open-minded because, the truth is, I have found that despite its strong, distinct flavor, miso is quite versatile and I have learnt to incorporate it in my cooking. Over the past four years, we have eaten many a miso dish. From miso noodles, to miso duck, to miso cod. 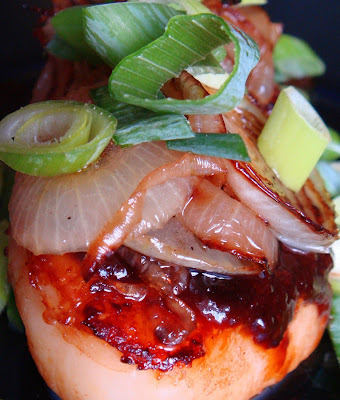 Which brings me to m newest miso creation: miso glazed scallops. Enjoy! 1. Combine miso paste, white wine, brown sugar and grated ginger. Add scallops and marinate overnight in refrigerator or for at least four hours. 2. Remove scallops from marinade and broil under broiler for 3 minutes on either side. 3. Meanwhile, transfer marinade to a sauce pan and cook over medium high heat, until reduced by half, about 3 to 5 minutes. 4. For caramelized onions, heat 2 tablespoons of vegetable oil over medium heat, add onions and cook for 15 to 20 minutes, stirring frequently until soft, fragrant and brown. 4. 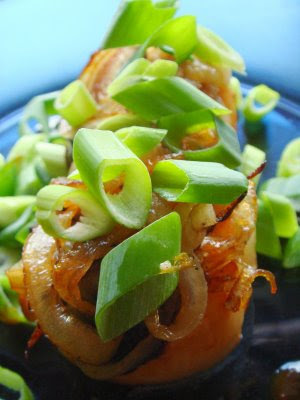 Spoon reduction over roasted scallops and serve with a mix of fresh scallions and caramelized onions. mmmmmm! Not very descriptive of me, but it's on the list to try! :) I like miso a lot too! That top photo is gorgeous! Gail, I hope you do give this a try. Miso is delicious on seafood.